Baldwin III was King of Jerusalem from 1143 to 1163. He was the eldest son of Melisende and Fulk of Jerusalem. He became king while still a child, and was at first overshadowed by his mother Melisende, whom he eventually defeated in a civil war. During his reign Jerusalem became more closely allied with the Byzantine Empire, and the Second Crusade tried and failed to conquer Damascus. Baldwin captured the important Egyptian fortress of Ascalon, but also had to deal with the increasing power of Nur ad-Din in Syria. He died childless and was succeeded by his brother Amalric. 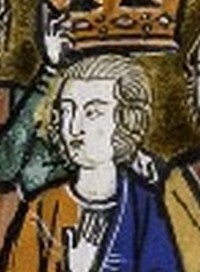 Raynald of Châtillon, also known as Reynald or Reginald of Châtillon, was Prince of Antioch from 1153 to 1160 or 1161, and Lord of Oultrejordain from 1175 until his death. He was born as his father's second son into a French noble family. After losing a part of his patrimony, he joined the Second Crusade in 1147. He settled in the Kingdom of Jerusalem and served in the royal army as a mercenary. The County of Edessa was one of the Crusader states in the 12th century. Its seat was the city of Edessa. The County of Tripoli (1109–1289) was the last of the Crusader states. It was founded in the Levant in the modern-day region of Tripoli, northern Lebanon and parts of western Syria which supported an indigenous population of Christians, Druze and Muslims. 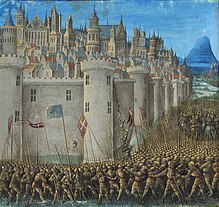 When the Christian Crusaders – mostly Frankish forces – captured the region in 1109, Bertrand of Toulouse became the first Count of Tripoli as a vassal of King Baldwin I of Jerusalem. From that time, the rule of the county was decided not strictly by inheritance but by factors such as military force, favour and negotiation. In 1289 the County of Tripoli fell to Sultan Qalawun of the Muslim Mamluks of Cairo. The county was absorbed into Mamluk Egypt. Constance of Hauteville (1128–1163) was the ruling Princess of Antioch from 1130 to 1163. She was the only child of Bohemond II of Antioch by his wife, Alice of Jerusalem. Constance succeeded her father at the age of two, after he fell in battle, although his cousin, Roger II of Sicily, laid claim to Antioch. Her mother assumed the regency, but the Antiochene noblemen replaced her with her father, Baldwin II of Jerusalem. After he died in 1131, Alice again tried to take control of the government, but the Antiochene barons acknowledged the right of her brother-in-law, Fulk of Anjou, to rule as regent for Constance. Tancred was an Italo-Norman leader of the First Crusade who later became Prince of Galilee and regent of the Principality of Antioch. Tancred had a great-grandfather with the same name, Tancred of Hauteville; since both Tancreds were from the house of Hauteville, they may be confused. Aimery or Aymery of Limoges, also Aimericus in Latin, Aimerikos in Greek and Hemri in Armenian, was a Roman Catholic ecclesiarch in Frankish Outremer and the fourth Latin Patriarch of Antioch from c. 1140 until his death. Throughout his lengthy episcopate he was the most powerful figure in the Principality of Antioch after the princes, and often entered into conflict with them. He was also one of the most notable intellectuals to rise in the Latin East. The Siege of Shaizar took place from April 28 to May 21, 1138. 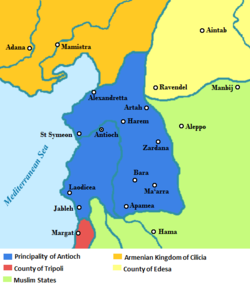 The allied forces of the Byzantine Empire, Principality of Antioch and County of Edessa invaded Muslim Syria. Having been repulsed from their main objective, the city of Aleppo, the combined Christian armies took a number of fortified settlements by assault and finally besieged Shaizar, the capital of the Munqidhite Emirate. The siege captured the city, but failed to take the citadel; it resulted in the Emir of Shaizar paying an indemnity and becoming the vassal of the Byzantine emperor. The forces of Zengi, the greatest Muslim prince of the region, skirmished with the allied army but it was too strong for them to risk battle. The campaign underlined the limited nature of Byzantine suzerainty over the northern Crusader states and the lack of common purpose between the Latin princes and the Byzantine emperor.